Drs. Willy Dayan and Pablo Kimos are committed to offering their patients state-of-the-art orthodontic care at their Toronto orthodontic practice. We believe that patient education is one of the most important aspects of your orthodontic treatment. This is why City Orthodontics has decided to provide our patients with oral hygiene tips to ensure they are taking care of their teeth both in and out of the office. Learn more about how to brush and floss properly with braces, take care of your retainer, and what foods to avoid throughout your treatment below. During the retention phase, it is important to brush your retainer every time you brush your teeth as they can accumulate food particles and plaque. Once a day, you should soak your appliance in a glass of room-temperature tap water with a denture-cleaning tablet, such as Polident® or Efferdent®. This will help prevent plaque build-up and oral infections and will keep your appliance tasting better. Do not use hot water as it can distort the appliance. You should avoid hard foods, such as ice and pizza crust, as well as sticky foods, including licorice and caramels. These foods can damage wires and brackets. It is also important to minimize foods high in sugar content, like ice cream and cookies, and reduce sugary drinks to once a day. Please see our dedicated “Foods to Avoid” section for more information. Now that you have your braces in place, it is just as important to maintain a good oral hygiene regimen throughout the length of your treatment as it was before. Braces, wires, bands and retainers can all trap food particles and make it difficult to brush or floss away plaque. Careful brushing and flossing, preferably after every meal and snack, is the best way to prevent plaque build-up, tooth decay and gum disease. Click on the buttons below to learn more about how to continue a proper oral hygiene routine while in braces. a straight angle. Use circular, vibrating motions. angling the brush down (up for the lower jaw). Keep moving in a small circular motion. by angling the brush up (down for the lower jaw). of both the uppper and lower jaw. under the archwire. A floss threader facilitates this. Start by pulling floss through the threader. archwire and pull the floss through. move it up all the way under the gums. An interdental toothbrush (proxabrush) is another aid you might find useful in keeping your teeth, braces and gums clean and healthy. It can be used to clean under orthodontic wires and around braces. 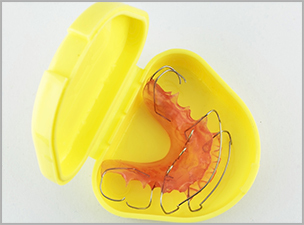 Use this device slowly and carefully, so you do not damage your braces. You should avoid hard foods, such as ice and pizza crust, as well as sticky foods, including licorice and caramels. These foods can damage wires and brackets. It is also important to minimize foods high in sugar content, like ice cream and cookies, and reduce sugary drinks to once a day. Hydrogen peroxide antiseptic mouth rinses, such as Peroxyl®, will reduce inflammation to your gums and cheeks. 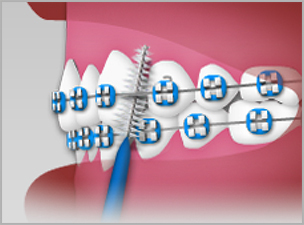 Peroxyl ® helps to prevent infection and decrease irritation that may develop from your braces. Rinse your mouth with two teaspoons of Peroxyl® (half a capful) for one minute and then spit it out. You may use Peroxyl® up to four times daily following your schedule for brushing: after meals (or after school) and before bed. Just like using peroxide for a scrape on your skin, Peroxyl® helps the inside of your mouth heal. Peroxyl® can be used for general irritation caused by your braces or for canker sores, cheek bites and other minor temporary injuries to the gums. Phos-Flur® is a sodium fluoride gel that helps prevent tooth decay while you are wearing braces by killing bacteria and replacing minerals in tooth enamel that have been exposed to harmful acids. The use of Phos-Flur® does not replace daily brushing and flossing but should be done following your daily schedule at bedtime. Place a small strip of Phos-Flur® on a toothbrush and apply it to your teeth for one minute and spit it out. You may not eat or drink for 30 minutes after you use Phos-Flur®. It is important for the active ingredient to stay on your teeth for 30 minutes, so do not wash it away by eating or drinking. Brush your removable appliance every day as a part of your regular brushing and flossing schedule. Because food particles and plaque can accumulate on your appliance just as they do on your teeth, soak the appliance daily. Dissolve a Polident®, Efferdent® or other denture-cleaning tablet in a glass of tap water at room temperature and soak your appliance once every day. Your appliance will taste better, and you will prevent plaque and bacterial accumulation.